Wang Chung’s was recently featured in Star Advertiser’s Pau Hana Patrol! Julia and Joanne Hara sing karaoke at Wang Chung's in Waikiki. Wang Chung’s is easy to miss — it’s hidden, in an alleyway off a side street behind the Hyatt Regency Waikiki. There’s no sign, and the door is discreet. Once you find it, though, you’ll be glad you did. This cozy little karaoke bar is one of the best kept secrets in Waikiki, with entertaining performers and enticing refreshments. There’s room for just about a dozen customers at the bar, and maybe a few more along a red banquette by the wall, and Wang Chung’s filled up quickly on a recent Thursday evening. The bartender, Brian Silva, was belting out a hit from the ’80s in between serving drinks when we arrived. He hit every note, giving a performance worthy of “American Idol,” and when he finished, everyone applauded. The cocktail specials ($1 off during happy hour) are worth the visit, too. Wang Chung’s makes its own lychee-infused vodka for the Lychee-co-tini ($8), which is mixed with Absolut Pear vodka and Calpico — topped off with two lychees on a stick, of course. The “To Die For Key Lime Pie” ($9) was my favorite — a luscious concoction of Malibu rum, vanilla vodka, fresh pineapple juice, fresh lime juice, simple syrup and a cream top sprinkled with (who would have figured?) crushed Nilla wafers. You can tell that the juice is fresh, and you can really taste the lime. Another cocktail with zing is the Moscow Mule ($7): vodka and fresh lime juice topped with fresh, homemade ginger beer. That’s right: Wang Chung’s makes its own from scratch, using locally grown ginger. The service is top-rate and professional. This isn’t the kind of place where they just bang out the booze and collect your tips, but where the bartenders know your name and drink, and fix it just the way you want it. If I had known about this place earlier, it would definitely be on my list for friends who visit from the mainland. Karaoke is free during happy hour, and just $1 a song during regular hours. After 8 p.m., expect it to be standing room only. DAN CHANG, 31, is the entrepreneur behind Wang Chung’s, often at the bar to personally greet customers with a hug. 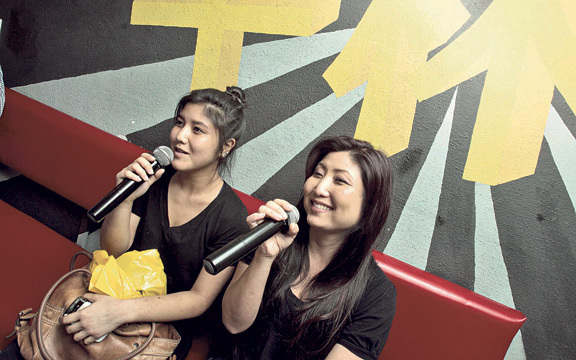 A former engineer who dabbled in real estate, Chang opened the karaoke bar three years ago this month. He was originally planning to flip it, but ended up keeping it. “This was one of the spaces I could never lease out,” he said. He transformed the 250-square-foot corner space (350-square-feet if you include the bathroom) into a bar modeled after “nomiyas,” or hidden, pocket-sized bars in Tokyo. The bar is named after the ’80s band (a light went on in Chang’s head while texting friends), and has a fun, Japanese pop-art vibe. It’s done up in clean, Zen-inspired lines, a combination of strong blacks and reds accented with hanging paper lanterns and unique artwork, including a mural depicting Godzilla. Karaoke is on two flat-screens, and it’s high-tech here: The song list is available online and accessible through your smartphone, eliminating those big, clunky binders filled with titles. No smartphone? Write down the song you want on a piece of paper and hand it to the bartender. Check out the giant okame, or “happy face,” on the rear wall — it’s actually where the door to the bathroom is hidden, blending seamlessly into half of the face. The bar is gay friendly, but the crowd is really an eclectic mix of gay, straight, locals, tourists, male, female, old, young, single, engaged and married. Pau Hana Patrol sends reporters out in search of rewarding happy-hour haunts. Visits are paid for by the Star-Advertiser.